To all my Jersey readers, especially from Monmouth and Ocean County I have a little treat for you. This treat is a new program called, 3 Square deals! 3SquareDeals.com is a new and very unique Deals program launching this week by Deborah Smith, Owner and Executive Editor of JerseyBites.com. Since its inception, JerseyBites has worked with New Jersey’s food banks on several occasions to help spread the word about the need for donations including the “Blogging Out Hunger” campaign spearheaded by Ms. Smith in 2008. “When I heard the statistics on how much the demand for assistance has grown in New Jersey over the past five years, I wanted to do more. A deals program that marries my knowledge of online marketing, social media marketing and food, seemed like the perfect solution,” explains Smith. 3SquareDeals.com represents the next generation of Deal sites which not only saves consumers money and drives new traffic and revenue to merchants, but also gives back to charitable programs. In today’s highly competitive Deals market, a new program has to do something different. “The response to this new concept has been extremely positive. The average consumer is bombarded with so many offers, every day. We need to give the consumer more reasons than just a good deal. Saving and sharing at the same time, does it get any better than that?” asked Deborah. Another factor that sets 3SquareDeals apart from other known deals programs is that the focus will be exclusively on food deals: Restaurants, Gourmet Food Stores, Wine and Beer and Culinary Experiences. First deals will include The Mill in Spring Lake Heights, LongBoard Grill in Point Pleasant Beach and The Wine Loft in Long Branch. The website prominently displays the logos of the three overarching hunger relief organizations that 3SquareDeals will be raising funds for, including The Community FoodBank of New Jersey, the FoodBank of Monmouth and Ocean Counties and the Food Bank of South Jersey. The site also plans to hold special “Deal Weeks” for local, smaller organizations where a Deal a Day will be offered featuring local merchants and all donations will be earmarked for the particular organization. Each organization will also receive a dedicated story on JerseyBites.com. In Monmouth and Ocean Counties alone the need for hunger relief has risen 80% over the past 5 years. For children it has risen 150% according to Linda Keenan, Director of Development for the FoodBank of Monmouth and Ocean Counties. Monetary donations are exceptionally valuable given the food bank’s purchasing power which allows them to stretch $1 into 3 meals. Using this equation, 3SquareDeals will be keeping a running tally on the site of the meals the deal purchases have been able to provide. 3SquareDeals is a place everyone can feel good about. You will save money while supporting neighbors in need and learn more about all of the amazing programs the Food Banks of New Jersey provide. It’s a win, win, win for everyone. As their tag line professes, it’s Where Deals Make a Difference. Now what could be better than that? Helping the world and getting a great meal at great price! 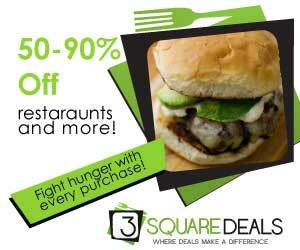 Make sure you check out 3 Square Deals today! You can also follow them @3squaredeals!